Syrian Troops Target Key Rebel-Held Town : The Two-Way Qusair is a strategically important town that lies between Homs, where the Syrian uprising began two years ago, and the Lebanese border. If President Bashar Assad's troops – reportedly backed by Hezbollah fighters — regain the town, they would control an important route from the coast to the capital, Damascus. 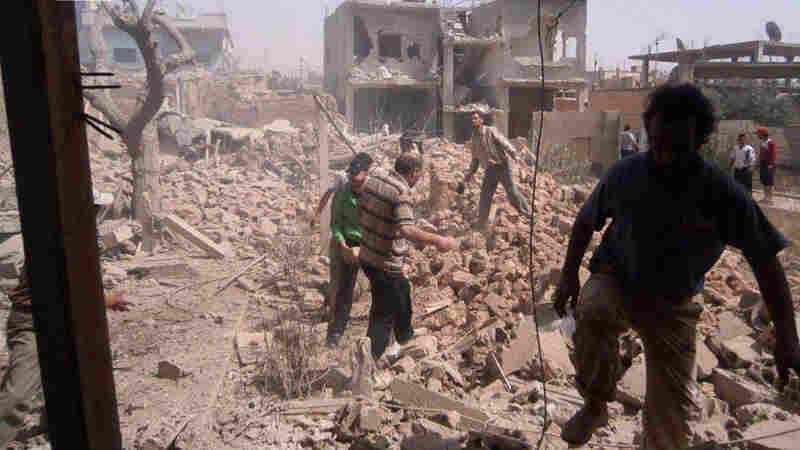 Syrians inspect Saturday the rubble of buildings damaged by government airstrikes in Qusair, Syria. The image was provided by Qusair Lens, and was authenticated based on its contents and other AP reporting. Dozens of people are dead in heavy fighting around the Syrian rebel-held city of Qusair where troops loyal to President Bashar Assad are making a strong push. News reports say as many as 50 people are dead. "Qusair is a strategically important town that lies between the city of Homs, where the Syrian uprising began two years ago, and the Lebanese border. The area has been under siege for weeks. "If the government regains control of Qusair, it would also control an important route from the coast to the capital, Damascus. "Opposition activists say the city has been bombarded by heavy shelling since early Sunday and residents have been forced into shelters. "Syrian State TV says its troops have made their way into Qusair's city center, but opposition groups deny it." The New York Times is reporting that Assad's forces are being backed by fighters from the Lebanese militant group Hezbollah. The Times reports that the battle "has brought Hezbollah's role in Syria to the forefront as the war becomes a regional conflict, pitting Shiite-led Iran, the main backer of ... Assad and Hezbollah, against the Sunni Muslim states and their Western allies that support the uprising." The fighting comes ahead of a U.S.-Russian brokered peace conference slated for next month. But as Eyder reported, Assad "essentially dismissed" to bring the civil war to a political solution. "Believing that a political conference will stop terrorism on the ground is unreal," Assad said in an exclusive interview with the Argentine newspaper El Clarin.